Q & A: Should I Panic about CLIA Changes? Come join me in Alexandria, Egypt! Are performance specifications based on biological variation for hemostatis unfit-for-purpose? Devolution and Revolution of QC: Whether "Westgard Rules" are still in your future? HbA1c for screening and diagnosis of diabetes? 2008: Update on "Alternative QC"
Where in the World is Westgard Now? Get an overview of ISO standards 15189, 14971, and 22367 and CLSI guidelines EP18, EP22, and EP23. With Risk Management coming into medical laboratories, now is the time to learn these important Risk Analysis concepts recommended by these documents. New standards and guidelines for Quality are heading toward the lab, based on Risk Management principles. Learn all about them now. Quality Planning and Design are part of a larger systems approach to analytical management. in this new six lesson course, participants will review current guidelines for quality and learn to use QC Design tools to customize their procedures and achieve the quality required by their tests. Our most popular course, covering the fundamentals of quality control in the laboratory. This course teaches all the experiments and calculations needed for a basic validation of a new instrument. Linearity, Reportable Range, Comparison of Methods, Correlation, Replication, Interference, Recovery, Detection Limit and Reference Range studies are explained and demonstrated. Educational online tools allow participants to enter data and view results immediately. Everything you ever wanted to know - and were afraid to ask - is included in this online course. All the rules, combinations, and interpretations are included. Online graphing tools allow you to enter data and see the interpretation. Westgard QC, Inc. was the first company to offer accredited online courses through both the AACC and ASCLS. More than a thousand participants from over 30 countries have taken our online courses. The Royal College of Pathologist of Australasia (RCPA), in association with the Australasian Association of Clinical Biochemists (AACB), have revised the Allowable Limits of Performance (ALP's) for 42 analytes in the Chemical Pathology QAP.The link will take you to the press release explaining the changes. We have update the list of ALP's on the Westgard website to reflect these changes. Notably, 21 analytes had tighter quality requirements applied, 8 had looser quality requirements applied, and 13 remained largely the same. The rationale behind the changes? The previous guidelines had been set somewhat arbitrarily around 30 years ago. The new numbers reflect an approach that is closer to the allowable errors derived from known within-subject biologic variation (aka the Ricos et al biodatabase). It's nice to see that organizations are updating their quality requirements to take into account new information and science. Even better to see that the requirements are moving in the direction of evidence-based goals, rather than goals set by committees or surveys. It takes a good deal of courage to change one of these goals. We have heard for several years that a group in the US is supposed to be considering an update of the CLIA goals for proficiency testing. However, nothing has changed here. When the probability is that most goals will get tighter, it's easy to assume that neither labs nor manufacturers are keen to see changes. Risk Analysis Guidelines provides an introduction and overview of the guidelines and standards that govern Risk Management practices in the laboratory. Risk Management is coming to the medical laboratory. CLSI guidelines and ISO standards strongly advocate that medical laboratories implement Risk Management as a way to assure quality in testing processes. While Risk Management is commonplace in other fields, it is new to the medical laboratory, particularly in the US. This online course will introduce participants to the CLSI guidelines EP18, EP22, and EP23, which provide a general framework for Risk Management in the laboratory, for both manufacturer and customer. The ISO standards 22367, 14971, and 15189 will also be introduced. As ISO accreditation becomes more dominant worldwide and grows in popularity in the US, the ISO requirements for the use of Risk Management are increasingly important. For a limited time, you can register for this online course at a discount. 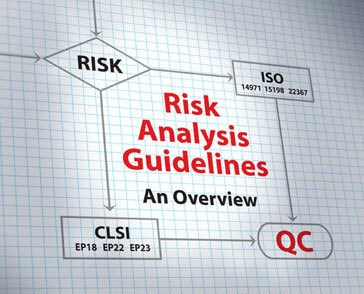 Visit the Risk Guidelines course homepage for more details. "Because of a requirement from various readers, data for Thyroglobulin have been revised together with one author of the two papers compiled. In this way, it has been seen that both papers used different units to express the within and between -subject coefficients of variation (CVI y CVG, respectively) , the fact that had not been realized when preparing our quality specifications table. Now, once all data are expressed in percentages, the values are: CVI= 14%, CVG=39% and consequently, the specifications are: imprecision (CV%)= 7.0, bias (SE%)= 10.4 and total error (TE%) = 21.9. "We want to express our thanks to the readers for their help, as well as to apologize for the disturbances this error could have caused. Please, take the present revision of the Specifications table for further uses. The biodatabase on Westgard Web has been updated to reflect this correction. Do you recall a few years ago there were reports that came out assessing the state of Proficiency Testing (PT) as well as a 2007 National Status Report on Laboratory Medicine? Well, that same group - The CDC Laboratory Medicine Best Practices Team - has been hard at work, and just released some new findings on Patient Specimen Identification, Critical Value Reporting, and Blood Culture Contamination. Is it time for a tighter quality requirement for glucose meters? Westgard QC is looking for a few good software testers. This isn't a free software offer. This is something where we need your evaluation, your feedback, and some of your time. In exchange, you'll get a copy of the software in question without charge. We're looking to find some labs where there isn't a Levey-Jennings charting and/or Method Validation software package already available on the instrument, LIS, or middleware. English fluency is an important factor - we need you to be able to easily express your reactions, your experiences with the software, your suggestions, etc. in written English comments. Note: this testing is not for QC Design software. Our EZ Rules software is in a stable state and no upgrades are in the air. This testing opportunity is about software for other tasks, like charting and method validation. If you're interested, please contact us at westgard@westgard.com by telling us about yourself and your laboratory. Attending the AACC/ASCLS convention predictably results in one frustration. Walking through the poster sections, you find that many of the method validation abstracts are only performing within-run precision studies. What's so bad about that?